This month I've signed up to participate in the Baha'i Blogging Challenge. 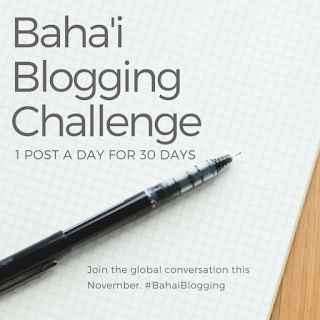 Everyday in November Baha'i bloggers are going to be posting about various topics to do with their faith. Since this blog started as part of my year of service I thought it might be an appropriate thing to take part in. Regular posting has never been a great strength of mine so I've been mulling over what to write about. One of the things that tends to make me procrastinate is the feeling that I should be picking up where I left off. I'm hoping this will get me out of that a bit more, but to scratch that itch I'll probably write a bit about the Baha'i perspective on death and dying. We were in that process with my father when I dropped off two years ago so in my mind that's where I left off. A topic that has to do with more current life events is my pregnancy. Birth and death seem so intertwined in the Writings, and after losing my father while trying to start a family, the two topics have become inextricably linked for me. I would also like to explore the process of preparing to become Baha'i parents. Other things I'm thinking of touching on are obligatory prayer, the recent bicentenary, answering questions I commonly get asked, and some of the prompts from the challenge. If anyone has anything else they'd like to see covered leave a comment and let me know. I'm still planning out what I'm going to do so there's still some room to work things in.